Somehow for him, those pesky glasses were no problem. 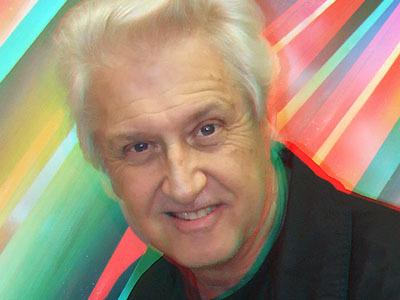 (CNS) - - Los Angeles - - 3D comics and film pioneer Ray Zone died yesterday at age 65. The artist, filmmaker and historian passed away at his Los Angeles home after suffering from heart failure. Zone championed stereography as an art form and broke into the comics industry in the 1980s, going on to apply the technique to more than 130 titles. His notable works include the John Byrne-penned 1990 graphic novel Batman 3D, as well as projects for Image Comics, Blackthorne, Disney, and Nickelodeon Magazine. Zone's skills in the field earned him the title of the "King of 3D Comics". He was a long-time member of the LA 3D Club and was serving as its vice president at the time of his death. Over the last decade, he converted the pages of DC Comics' Action Comics #851 into 3D, and worked on several projects with legendary comic book artist Joe Kubert, who ironically also just passed away this year (August 12) practically three months to the day of Zone's passing (November 13). So first Kubert and then Zone - could this be some sinister attack against 3D pioneers? What is the 2D world afraid of? Stay tuned!